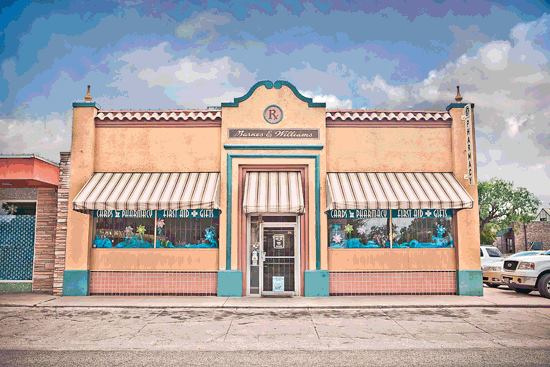 Step into the past when you enter the doors of Barnes & Williams Drug Center... Abilene's longest established pharmacy. The lovely old building with high ceilings and decor of antique pharmaceuticals gives you the feel of the drug store you frequented as a child. The staff is friendly, you are greeted by your name, the service is outstanding, city-wide delivery service is available, and you can speak directly with the pharmacist. The technology in our pharmacy is cutting edge. Larry Pittman, R.Ph. is the pharmacist on duty as well as the owner of the store; so why the name Barnes & Williams Drug Center? Mr. Jack Barnes and Mr. Paul Williams opened Barnes & Williams Drug Center in 1930 in Breckenridge, Texas. To expand their business Mr. Barnes came to Abilene in 1939 and opened Barnes and Williams Drug Center. Mr. Williams stayed in Breckenridge, Texas. In 1966 Larry Pittman along with his step-father Sam Allen purchased the pharmacy. At the time there was a full service soda fountain service. Much to our disappointment, Sam Allen removed the fountain in 1975 stating it was a financial liability rather than an asset. In 1989 Sam Allen retired and Larry and Barbara Pittman, Sam's step-son and daughter-in-law purchased the store from him and continue to own and operate the store. Today, while maintaining a family friendly corner drug store tradition we utilize technology that is state of the art along with the cooperative purchasing power of thousands of independent pharmacies in the United States to compete price wise with the largest chain stores. The gift shop in the pharmacy has grown tremendously under the watchful eye of Barbara. Inspirational gifts, fashion jewelry, designer handbags, home decor, greeting cards, candles, and unique gift items are available at the store. Free gift wrapping is the icing on the cake at this unique family-owned pharmacy. Drop by and see us, the coffee pot is always on.